The despair of seeing how much food is wasted every day on this planet is enough to make you cry. I too am guilty of tossing away food that spoiled before I had a chance to use it. I think sometimes my lack of meal planning, my ‘virtuous good intentions’ with particular vegetables, and occasional blasé approach to meal preparation has led to this. I have so much food in my freezers (yep, we have two fridge/freezers) that I could be mistaken for a prepper! My aim is to use up what I have… before buying more. To that end, I had leftover cream in the fridge and a bag of onions in the pantry to use up. Both of which were bought to use only a little in a recipe, with no plans for the remainder. Until I saw a post from the blogger Phoodie come up in my Facebook feed; Baked Onions with cream, cheese and thyme. Good thing today (Monday 12 June) is the Queen’s Birthday public holiday, which allowed me time to potter about in the kitchen. 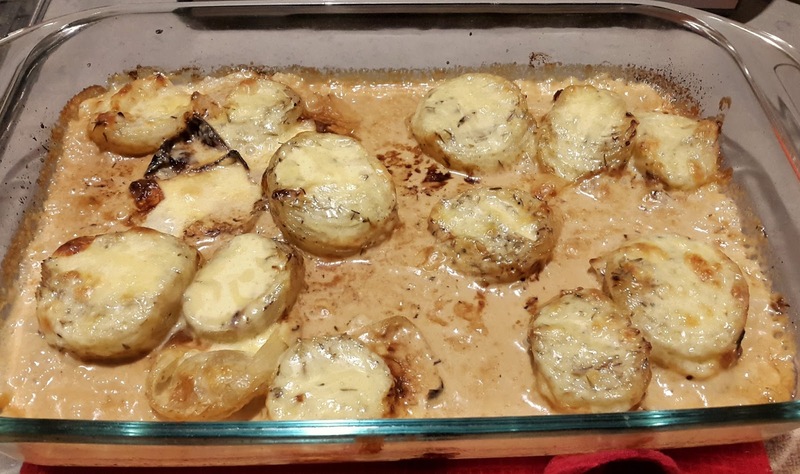 The first cooking step of these baked onions is to bake them for 1.5 hours, so plan ahead so they are ready by meal time. I adapted Phoodie’s post (which is actually a Donna Hay recipe) here and there a tad. I didn’t have Gruyere cheese, and wanted to use all tasty cheese. Next time I think I’ll work in some Parmesan for some sharpness, and reduce the tasty cheese. I also added the thyme at the time the onions first went into the oven, to boost the flavours when roasting, and reduced the amount called for. Step 1: Place the onions cut side up in a large baking dish. Sprinkle over the thyme, salt & pepper, then drizzle over the olive oil. Cover with aluminium foil, and bake in a 180 degree oven for 1.5 hours. Step 2: After 1.5 hours, check that the onions have softened. If so, remove the foil and let bake for 15 minutes to slightly brown the tops. Step 3: In a small bowl, mix the cream, mustard and cheese, then pour over the onions making sure to dollop cheese particles on each of the onion halves. Step 4: Bake for another 15 to 20 minutes, or until the dish becomes a nice golden colour and the cheese begins to brown. I served this side dish alongside a pasta/chicken/bacon/sun-dried tomato dish. Probably not the best choice, but I had taken out some frozen chicken earlier in the day, and had bacon in the fridge to use up. 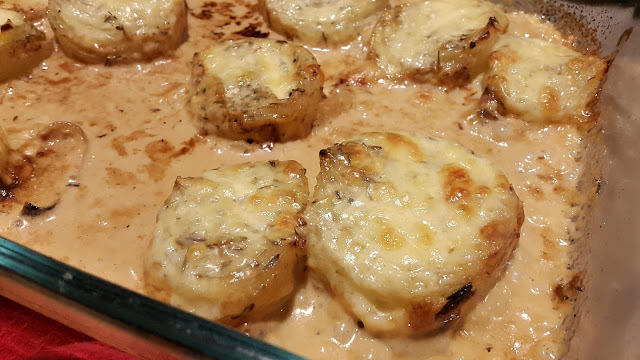 These baked onions would pair brilliantly with a roasted joint of meat, like a lamb shoulder, or beef brisket. The cost of this dish is really economical, and would make a tasty ‘pot luck’ offering when feeding a large group. Tell me reader, what are your strategies for reducing food? I love how you have made onions the star of the dish her, they are often overlooked when in reality they are what carry the dish. Absolutely! they are so overlooked. But so cheap and bake up so well, if you have the time. I'm really big on not allowing food go to waste - probably the result of being brought up by frugal parents. What we cook each evening is determined purely by what's in the fridge, freezer or cupboard and we work around that, shopping only to supplement these ingredients if we need to. If we go away and there is still food in the fridge, I pop it in the freezer. It's amazing what you can freeze - I freeze almost anything! My Momma used to joke about the steps one takes in trying NOT to throw good food out, like a) freeze leftovers even if it's just a portion for one 2) wack glad wrap on it & put it in the fridge for later 3) go through fridge and throw out all those little furry dishes under glad wrap!!! Guilty as charged. But... oh yes, there is a "but".... I've become a bit more conscious lately and actually been enjoying looking at odd bits of left overs or vegs that have got to get some cooking lurve and found there are so many things to do with food that not only taste great, but challenge you to think, create and eat a little differently. Good post Kirsty, loved it. Kirsty, looks delish. And I'm always excited to find someone interested in reducing their food waste. A couple of things that help me are: 1) I buy only enough of something for a particular use. If I need 3 pounds of potatoes for a recipe, I don't buy a 5-pound bag. 2) If I'm cooking a dish that isn't suitable for freezing, I cook only enough for that meal, so there are no little dishes of stuff going fuzzy in the fridge.